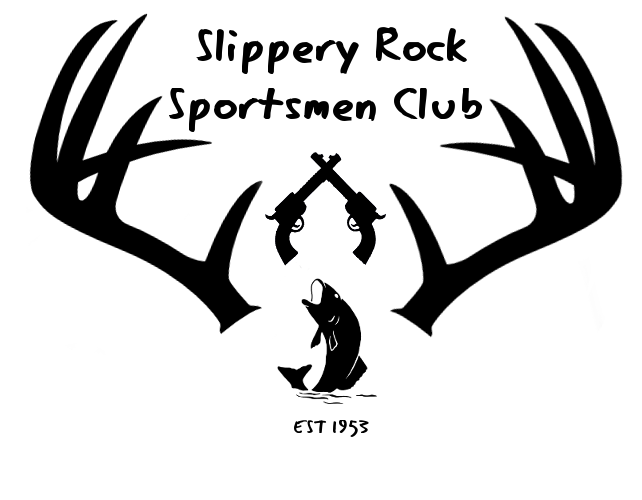 Located on 65 Acres on Sportsman Lane, off of Keister road, one mile east of route 173 (S. Main St.) in Slippery Rock. The club features include 25 Yard, 50 Yard, and 100 Yard shooting ranges. Archery range, fishing lake and clubhouse. Member meetings are held the first Wednesday of the month at 7:30 PM.
. Shooting hours 9:00 AM until sunset daily.
. These facilities are for members only and their (2 max, one time) guests.
. NO ALCOHOL permitted on ranges at any time.
. No one under the influence of alcohol or drugs is allowed on any range.
. Only single sheet paper or cardboard targets and clay pigeons permitted.
. Mount targets so shots DO NOT damage support posts.
. When finished please remove targets and dispose of properly.
. Please remove all cardboard from the property.
. Please clean up the area when finished.
. DO NOT shoot into the ground.
. All shots must directly impact the backstop.
. Please limit your shooting time if others are waiting.
. Coordinate downrange activity with shooters on adjacent ranges.
. Firearms must be unloaded and not handled when other shooters are down range.
. This includes when shooters are down range on adjacent ranges.
. All shots must be individually aimed. Un-aimed rapid fire not permitted.
. Put misfired/dud cartridges into the container provided, or, take them with you. Do NOT dispose of in trash can.
. Eye and ear protection is required for all shooters and spectators.
. Range(s) may be closed for scheduled events.
. Please report any abuse of this facility.